3 Business case 3-4 Dec. 2012 ESSnet Workshop, Rome 3 In November 2011, the Council called upon ESS " … to take effective measures ensuring a substantial reduction of the response burden by redeveloping Intrastat, while maintaining a sound level of quality needed". 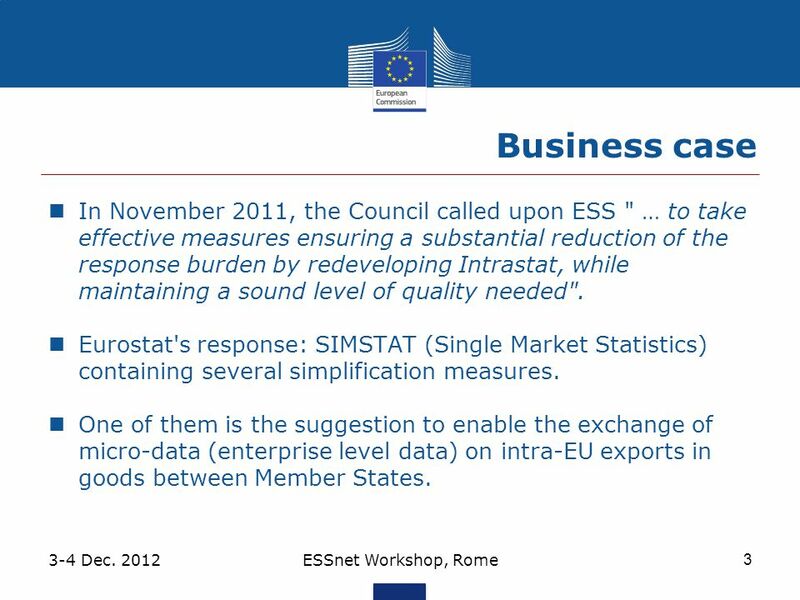 Eurostat's response: SIMSTAT (Single Market Statistics) containing several simplification measures. One of them is the suggestion to enable the exchange of micro-data (enterprise level data) on intra-EU exports in goods between Member States. 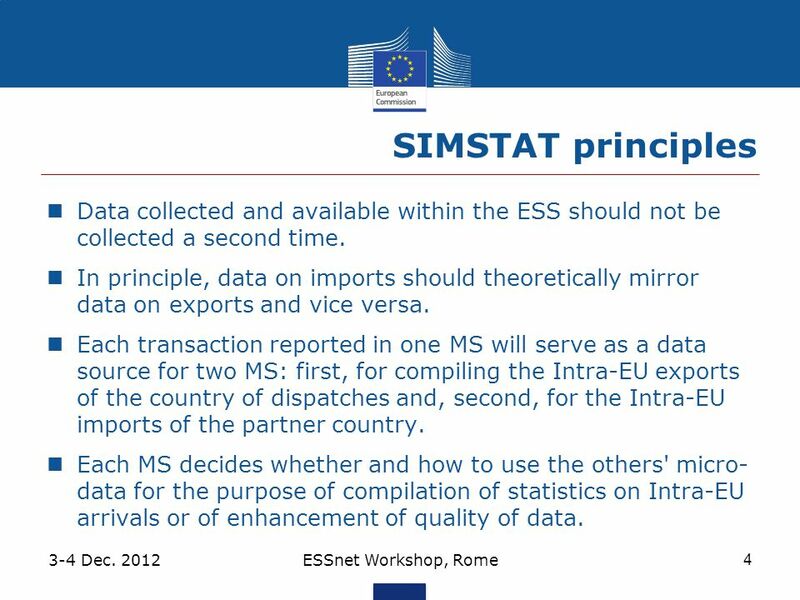 4 SIMSTAT principles 3-4 Dec. 2012 ESSnet Workshop, Rome 4 Data collected and available within the ESS should not be collected a second time. 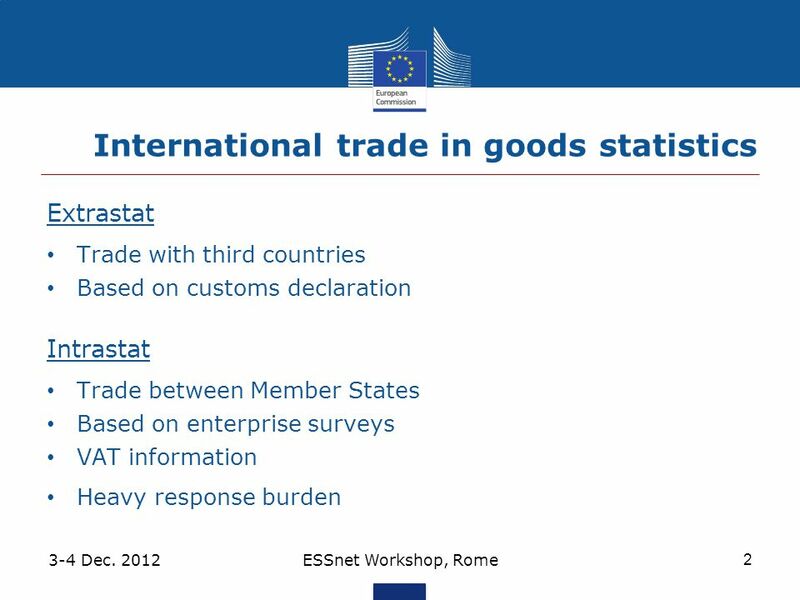 In principle, data on imports should theoretically mirror data on exports and vice versa. Each transaction reported in one MS will serve as a data source for two MS: first, for compiling the Intra-EU exports of the country of dispatches and, second, for the Intra-EU imports of the partner country. 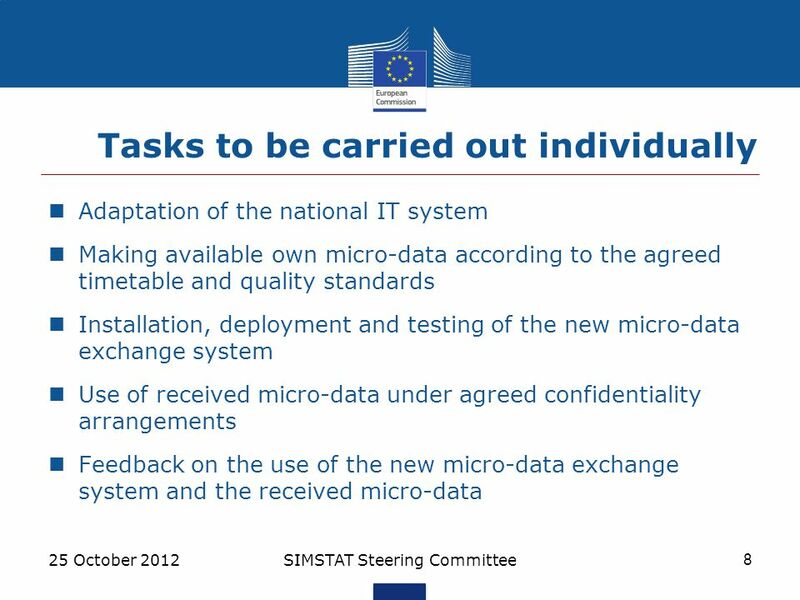 Each MS decides whether and how to use the others' micro- data for the purpose of compilation of statistics on Intra-EU arrivals or of enhancement of quality of data. 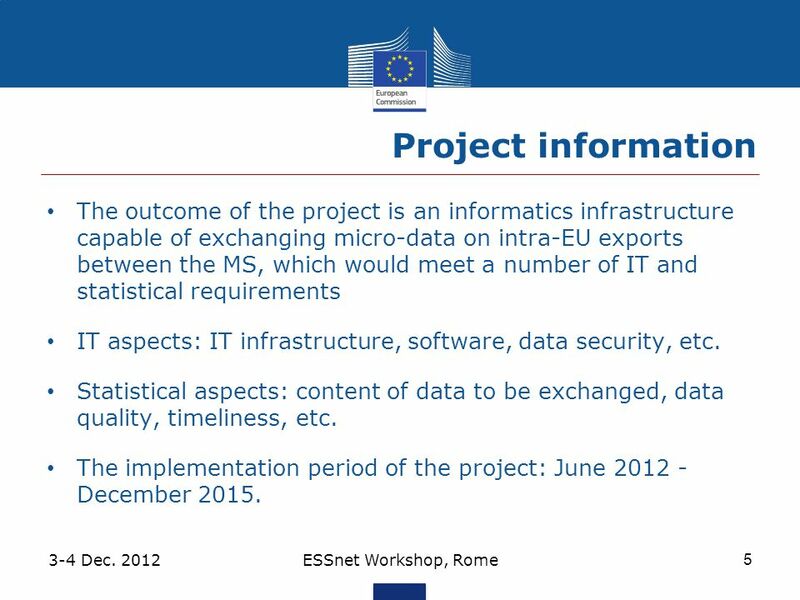 5 Project information 3-4 Dec. 2012 ESSnet Workshop, Rome 5 The outcome of the project is an informatics infrastructure capable of exchanging micro-data on intra-EU exports between the MS, which would meet a number of IT and statistical requirements IT aspects: IT infrastructure, software, data security, etc. Statistical aspects: content of data to be exchanged, data quality, timeliness, etc. The implementation period of the project: June 2012 - December 2015. 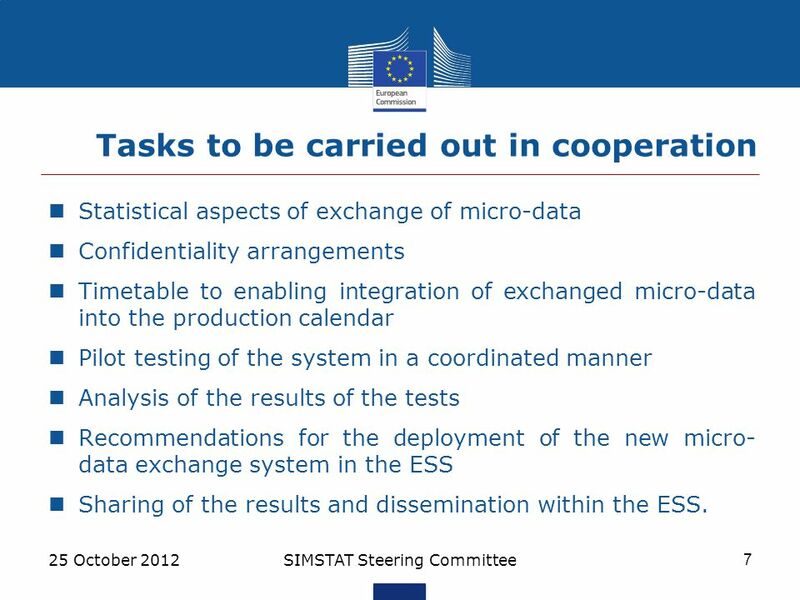 7 Tasks to be carried out in cooperation 25 October 2012 SIMSTAT Steering Committee 7 Statistical aspects of exchange of micro-data Confidentiality arrangements Timetable to enabling integration of exchanged micro-data into the production calendar Pilot testing of the system in a coordinated manner Analysis of the results of the tests Recommendations for the deployment of the new micro- data exchange system in the ESS Sharing of the results and dissemination within the ESS. 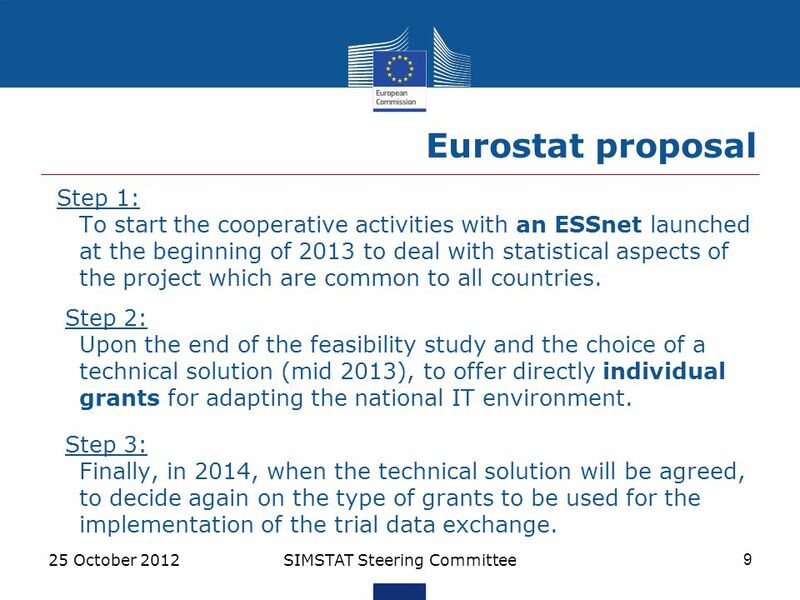 9 Eurostat proposal 25 October 2012 SIMSTAT Steering Committee 9 Step 1: To start the cooperative activities with an ESSnet launched at the beginning of 2013 to deal with statistical aspects of the project which are common to all countries. Step 2: Upon the end of the feasibility study and the choice of a technical solution (mid 2013), to offer directly individual grants for adapting the national IT environment. Step 3: Finally, in 2014, when the technical solution will be agreed, to decide again on the type of grants to be used for the implementation of the trial data exchange. 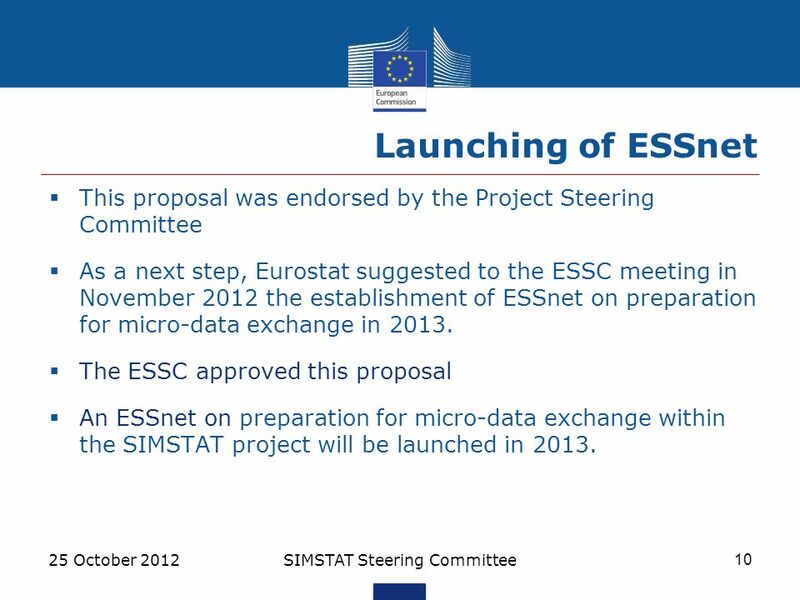 10 Launching of ESSnet 25 October 2012 SIMSTAT Steering Committee 10  This proposal was endorsed by the Project Steering Committee  As a next step, Eurostat suggested to the ESSC meeting in November 2012 the establishment of ESSnet on preparation for micro-data exchange in 2013. 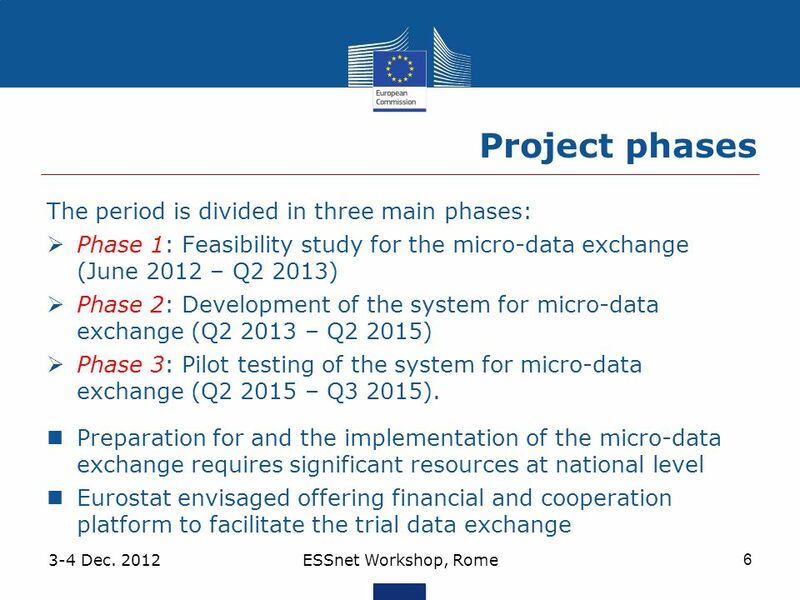  The ESSC approved this proposal  An ESSnet on preparation for micro-data exchange within the SIMSTAT project will be launched in 2013. 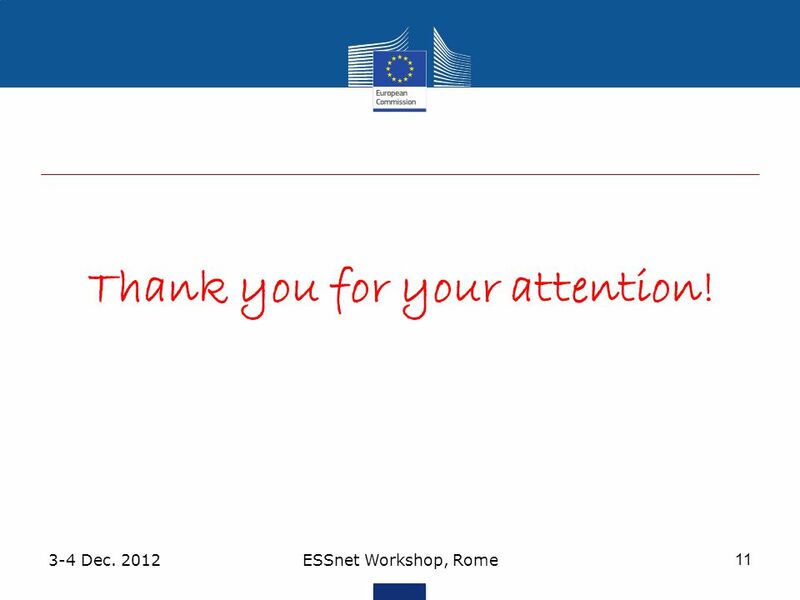 11 3-4 Dec. 2012 ESSnet Workshop, Rome 11 Thank you for your attention! 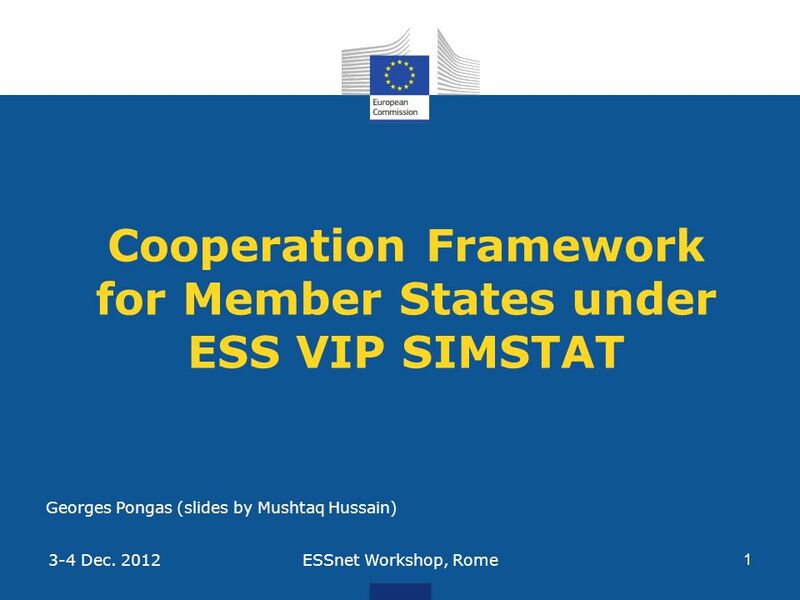 Download ppt "Cooperation Framework for Member States under ESS VIP SIMSTAT ESSnet Workshop, Rome 1 3-4 Dec. 2012 Georges Pongas (slides by Mushtaq Hussain)"
Eurostat The reform of Intrastat Past experiences and future plans Walter Radermacher Chief Statistician of the European Union. Compliance with Statistics under Single Authorisation for simplified procedures and centralised clearance Customs seminar on "Single Authorisation. Eurostat T HE E UROPEAN PROCESS OF ENHANCING ACCESS TO E UROSTAT DATA A LEKSANDRA B UJNOWSKA E UROSTAT. ESS VIP PROGRAMME An overview ESSNet workshopWG LUXEMBOURG 22/11/2012. ESS reference metadata implementation of standards and interoperability of National/European metadata systems Bogdan Sorin ZDRENTU, Eurostat (B5) Mogens. Olli-Pekka Penttilä Director of Statistics / Co-ordinator Finnish Customs Nordic meeting 2014 Preparation for exchange of micro-data on intra-EU. The European Statistical System Vision Infrastructure Programme Daniel Defays, Director Directorate B, Eurostat Eurostat Workshop on the Modernisation. Eurostat Coverage of Security Issues Pascal Jacques ESTAT B0 Local Informatics Security Officer. Joint UNECE/Eurostat work session on statistical data confidentiality October 2013 Ottawa, Canada Improvement of access to European microdata Outcome. Decentralised and Remote Access to Confidential Data in the ESS (ESSnet DARA) Overview and State of the Art Maurice Brandt Destatis FIRST EUROPEAN DATA. 1 M ESH PROJECT : P RODUCTION OF A M ANUAL FOR S TATISTICS ON E NERGY C ONSUMPTION IN H OUSEHOLDS Developing energy consumption data to meet users needs. High-Level Meeting of Regional Energy Regulatory Associations of Emerging Markets Sergey Novikov Head of the Federal Tariff Service (FTS of Russia) April. 1 ESSnet Workshop 2012 Cavour Conference Centre, Rome 3-4 December 2012 Final conclusions from the workshop Donatella Fazio, Istat. ESS-VIP ICT Project ESSnet Workshop, Rome, 3-4 December 2012. European Conference on Quality in Official statistics, Rome 8-11 July 2008 Quality framework in European Trade Statistics Anne Berthomieu International. A project implemented by the HTSPE consortium This project is funded by the European Union SMART AND INCLUSIVE GROWTH CUSTOMS 2020 2014-2020.